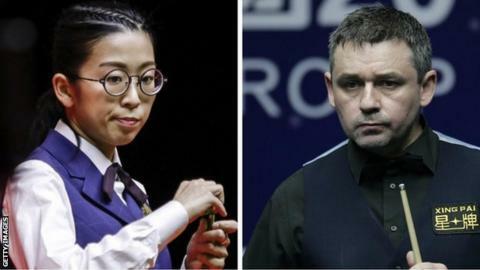 Before the match, Alan McManus said he would treat Ng On-yee "like any other very good player"
Scotland's Alan McManus edged past women's world number one Ng On-yee in the first round of the World Snooker Championship qualifiers. Hong Kong's Ng, 28, has won the women's world title for the past two years and edged ahead again, but McManus pulled clear to win 10-6 in Sheffield. England's Reanne Evans, the only other woman playing, lost 10-2 to Zhang Yong. McManus' compatriot Ross Muir was beaten 10-3 by England's Tom Ford.